Has Bruno Mattei ever made a bad movie? Or at least a bad movie that I haven’t loved? The Auteur of Awful responsible for such varied success stories as Rats: Night of Terror (the best giant-rats-take-over-the-world movie ever! ), Hell Of The Living Dead (crossdressers against zombies? That’s just common sense film making! ), the literally excrement-filled Violence in a Women’s Prison, and the impenetrably fantastic mess that was aptly titled The Other Hell, checks in with his take on yet another junkfood genre – the killer shark movie! Made in 1995, far removed from the heyday of economical Italian versions of more popular American films, Cruel Jaws is a testament to Bruno Mattei’s legendary talents. The credits may claim it was shot sometime when Bill Clinton was rocking portly interns, but despite its meager budget the film is able to accurately recreate the heady days of the late 1980s. The hair, clothes, and music all call to mind the Italian classics of the later part of that decade such as Ghosthouse and Hitcher in the Dark. In fact, during one of the opening scenes, I could have sworn that Billy and Vanessa were driving the exact RV that the killer drove in Hitcher in the Dark! And considering what you see in the rest of the movie, I’d be surprised if it wasn’t the same RV! You see, Bruno is just as much as businessman as he is a craftsman and sometimes you have accommodate your artistic vision with smart business decisions. 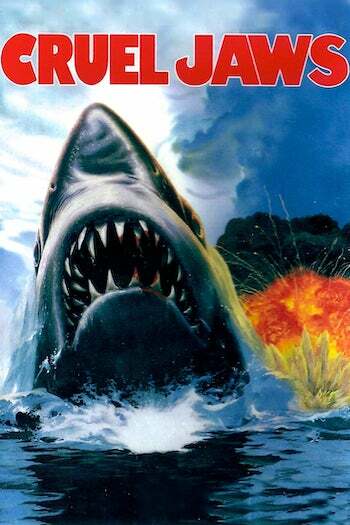 And sometimes a smart business decision is the liberal use of footage from Enzo Castellari’s The Last Shark during some of Cruel Jaws. And by “some of Cruel Jaws” I mean all of the action scenes involving sharks, helicopters and sail boat races. But it’s not like Bruno didn’t shoot all the stuff involving our characters standing around and reacting to all that stock footage. And really, besides all the good stuff like sharks eating people and chewing up boats, the sequences where ugly people you don’t care about babble about how they’re going to get revenge on this evil fish are really what we’re here for, right? I mean, heck, if you wanted to see this business with the helicopter and sailboat race, you could have just watched it when it first appeared in The Last Shark, couldn’t you? The story that Bruno fashions around his shark highlights is one of those timeless tales of a tiger shark who was raised by the U.S. Navy to be the perfect killing machine and who is let loose upon an unsuspecting world when his boat sinks. As if having a Rambo fish trawling the watery depths wasn’t crisis enough for the sleepy little town of Hampton Bay, it’s also right during the big regatta! This allows Bruno to demonstrate his expert editing ability as he alternates long shots of the regatta from The Last Shark with close-ups of the two guys from his movie “participating” in it. They’re both shot from the waist up and it’s clear they aren’t anywhere near any water, but they do lunge back and forth quite a bit. In fact the only time they’re in the water for the race is when one of them pushes the other off his surfboard and then it was clear that they were standing still! What’s even more creative though is how our two characters have sails whose colors don’t match any of the sails in the footage from the The Last Shark! The reason this regatta has to go off in spite of Cruel Jaws (CJ) feasting on every horny beachgoer he can get his fins on is because of the evil rich hotel owner. He’s got a real estate deal cooking and can’t afford for the tourist trade to be damaged. He’s also trying to evict Dag, the owner of the local Seaworld-type attraction. Normally, I would point out how lame Dag’s establishment is since it seemed to consist of three dolphins, a seal, and a kid in a wheelchair, but I’ll give it a pass this time because the seal pushed the evil rich hotel owner into the pool! Twice! And also because Dag looks like Hulk Hogan. Go ahead and let that sink in. This dude has long, thinning blonde hair and blonde mustache just like the Hulkster. If you drank enough gin and squinted your eyes, you may be able to fool yourself into thinking that you’re watching a really long, bad episode of Thunder In Paradise. I won’t lie to you – I was secretly hoping that Dag would lay an awful-looking leg drop on CJ, but the most he did was mess around with a harpoon and reminisce about his bygone whaling days. After the regatta gets attacked (CJ even tries to eat the girl in the wheelchair! CJ is one COLD killing machine!) the movie unfolds as you would expect with the sheriff going fishing for CJ from a helicopter (yes, he drops a giant line and hook with hunk of meat on it out of the copter), the Mafia guys from Chicago coming by to tell the hotel owner they’ll take care of the shark problem he’s been having, and Billy somehow coming up with a bomb to go along with his equally implausible theory that the shark will be milling around the shipwreck right when the bomb goes off. Wait a minute. Did I mention something about some Mafia sharkhunters? That’s right! The Mafia is involved in the hotel guy’s real estate business and they come down in person to protect their investment. Thus we are treated to the scene where two mopes head out on a stolen boat to go and kill CJ. Though I was a bit dubious about their abilities to do this, one of the guys remarked that he was in the marines and the marines did liberate Iwo Jima from killer sharks, right? And you know what? Bruno packs all this into just a little bit more than 90 minutes! In the hands of a lesser director, secret military shark weapons, Mafia real estate schemes, jealous boyfriends, forbidden love, brats in wheelchairs, wacky seals, attempted dolphin poisonings, a dancing scene, a beatdown, a regatta, copters, skeptical cops, the Hulkster, shipwrecks, and characters spouting lines like “he’s hanging around like a bad smell” would be as bloated as a two week old drowning victim. Bruno thankfully knows though that in a cut and paste job like Cruel Jaws, you cut the fat and paste in as many inexpensive disparate plot elements as you can think up and as much shark mayhem as you can beg, borrow or steal! You must have a really old copy of that review! But never let it be said that MonsterHunter ignores the fans. I have dug deep into the archives and found the original passage and restored it! Cruel Jaws – now with 20% more Hulkster! Hah, you are the man! It’s just that I been reading your stuff for a while now and quips like that keep me coming back for more!